This trip has it all for anyone looking for an adventure tour combined with an off-the-beaten track cultural experience in Papua New Guinea. Kayaking, Stand Up Paddle Boarding, trekking and an authentic cultural experience in PNG all thrown into the one adventure. Discover the Milne Bay Province on this real-life PNG adventure tour taking you into an area few tourists have walked or paddled. Discover Samarai and Kwato Islands, both with historical significance in WWII. 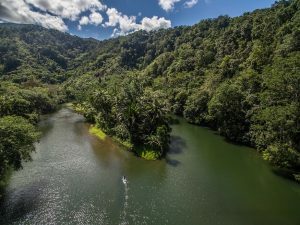 Trek through the local rainforest, around bays and across rivers passing and meeting surprised locals along the way going about their everyday routines. 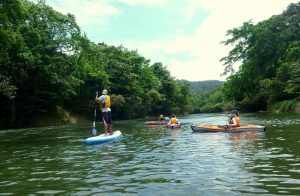 Kayak or Stand Up Paddle down the Dawada River, a calm flowing river providing an enjoyable experience, plenty of time to admire the scenery and soak up the quiet atmosphere. Spot wildlife like the Bird of Paradise or Horn Bills, stay in traditional homes and guest houses, eat traditional food and make new friends along the journey. This new PNG adventure tour is part of an innovative tourism project: the Integrated Management Plan Product (IMPP), which is partnering local communities with select tourism operators to open up corridors of sustainable tourism in PNG. IMPP is helping local land resource custodians get involved in all aspects of the tourism experience in an equitable and sustainable way, by being involved in the design and operation of the trips as well as benefitting directly from fees and levies collected. The visitor groups are deliberately kept small – maximum of 12 people within the IMPP quota, to create an intimate and unique holiday experience while also ensuring conservation and protection of the natural environment. A ‘win-win’ situation for all involved. Join us on a Papua New Guinea Adventure Tour that is real and raw. Few tourists have walked or paddled this part of the country – be one of the first. Tours run with a min. of 6 persons and max. of 10. Contact us for more information including detailed itinerary and prices. This tour can be combined with other regions, tours and activities in Papua New Guinea.